کارهای هنری نوآورانه با کاغذ و کتاب. یه جورایی هم ممکنه به بعضی ها -مخصوصا طرف‌داران کتاب و کتاب خونی- بربخوره! پیشاپیش عذر! 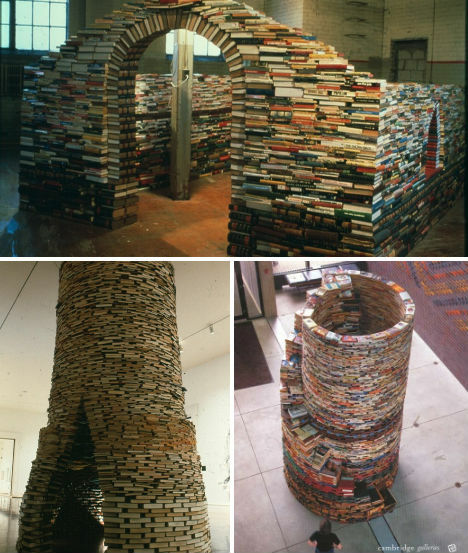 This incredible tower of books is real – but it's not exactly what you think. Built by artist Matej Kren, who previously built a similar book building in Prague, "Scanner" was a walk-through exhibit wherein the visitor enters a seemingly infinite tunnel with books that go on and on. 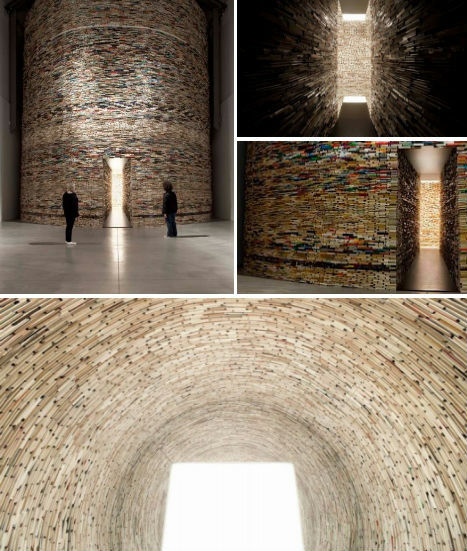 It was, indeed, created with thousands of books, but mirrors enhance the effect. "Mirrors become an instrument to create illusion and, at the same time, to unmask it. Since the public can easily see themselves reflected in a false infinite – thus discovering the illusion – the problem becomes the latency of perception." 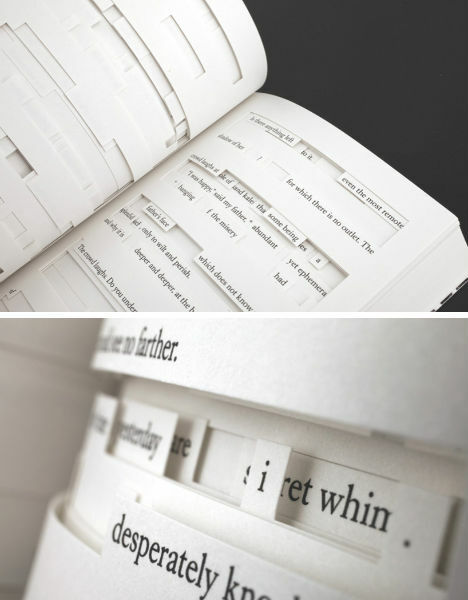 A work of both art and literature, and a commentary on the limitations of digital publishing, Jonathon Safran Foer's book Tree of Codes relishes the physicality of paper and the ways in which it can be manipulated for enhanced value. Each page is die-cut to reveal only certain words – taken from The Street of Crocodiles by Bruno Schulz – in a printing technique that reveals a message in patterns. 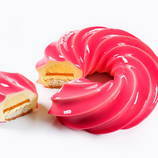 The concept was rejected by one printer after another before Belgium's Die Keure agreed to take it on. Does this work defy translation into digital reading devices? Some say the effect could be reproduced using Flash, but it just wouldn't be the same. Artist and mathematician Robert The got his start working with books after a brief, unexplained period in which he was left unable to read cultivated a new appreciation for letters as symbols, and all of the information and emotion they are able to convey. 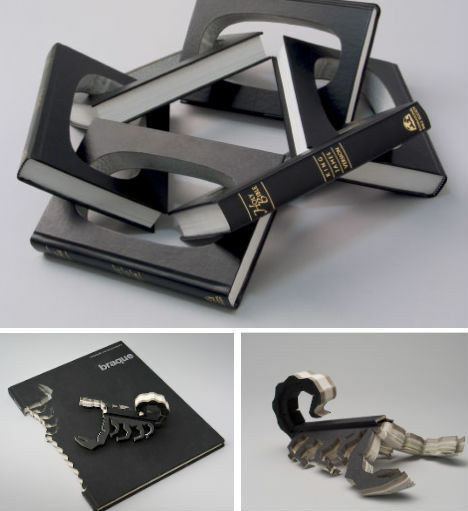 Rescuing discarded books from dumpsters, The began cutting them into shapes (including his well-known book guns), sometimes interlocking them into puzzling sculptures. 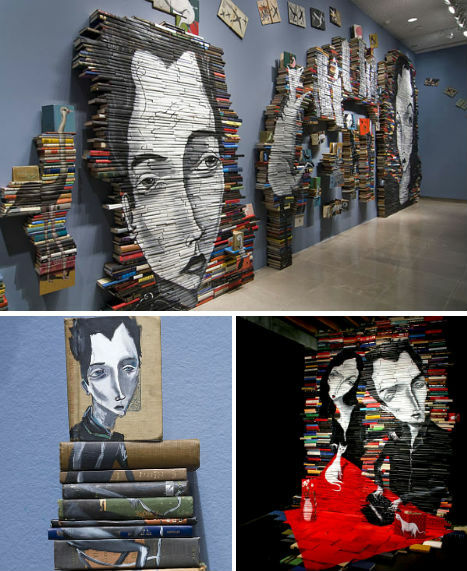 The melancholy characters of artist Mike Stilkey are even more captivating when they stand seven feet tall, painted onto an installation of 5,000 books. 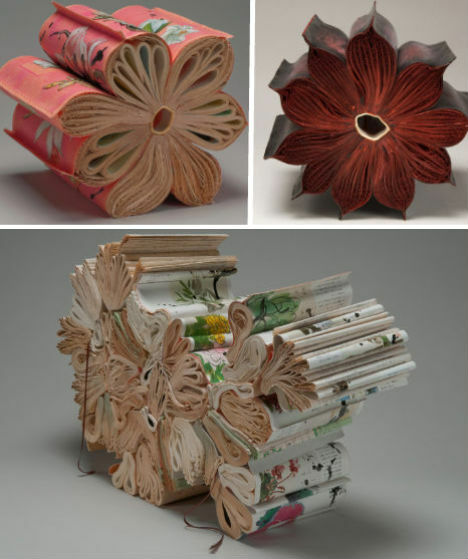 Stilkey's paintings on individual book pages gradually morphed into painting down the spines of stacked books. Like so many other book artists, Stilkey finds inspiration in the imagined lives of the books' former owners. "I'm always interested in the notes or messages left in the books by people who used to own them. I would look for discarded or forgotten items left in the books. One time I found two unused plane tickets to New York from 1967." 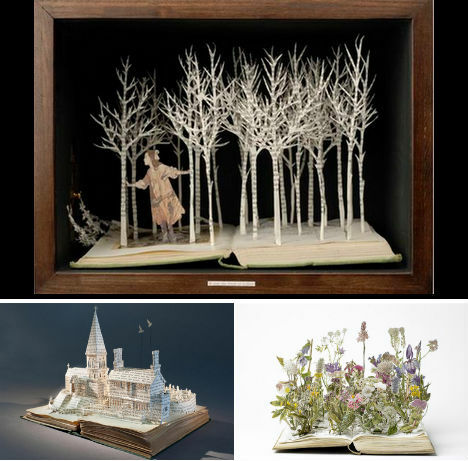 Artist Su Blackwell coaxes life from the pages of a book, not through vivid descriptions but through very precise cuts. "Paper has been used for communication since its invention; either between humans or in an attempt to communicate with the spirit world. I employ this delicate, accessible medium and use irreversible, destructive processes to reflect on the precariousness of the world we inhabit and the fragility of our life, dreams and ambitions." 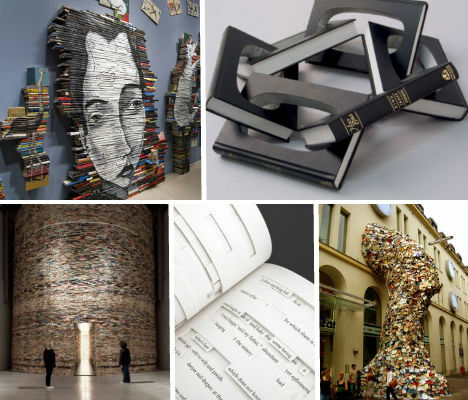 Each of Tom Bendtsen's book sculptures in his 'Arguments' series is made of at least 10,000 books, and, he says, "sought to reflect the fragility of arguments, which are mostly inflexible in a history that is fluid." While some earlier work considered the text of the books – getting more and more superficial as the tower gets higher – his more recent towers are concerned with color and form, using the books like pixels. Trained in both 'traditional' and contemporary approaches to art, Alaskan native Nicholas Galanin uses the unusual medium of books to explore and celebrate his Aleut/Tlingit heritage in the series "What Have We Become?" 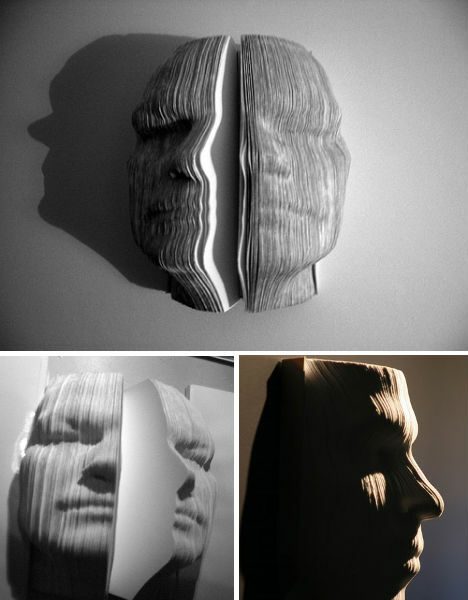 Galanin redefines the term 'native art' to fit into the modern world, sculpting three-dimensional human faces out of a book that tells the tale of his people, Under Mount Saint Elias. 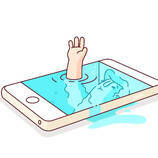 ".The complexities of cultural growth and interaction create preconceived ideals, perspectives and viewpoints. Through action and creative risk taking, I, as an artist am able to partake in this cultural development." To artist Jacqueline Rush Lee, there's nothing inspiring about blank canvas. She desires meaning in the medium itself – making books the ideal material to shape, alter and sometimes destroy. 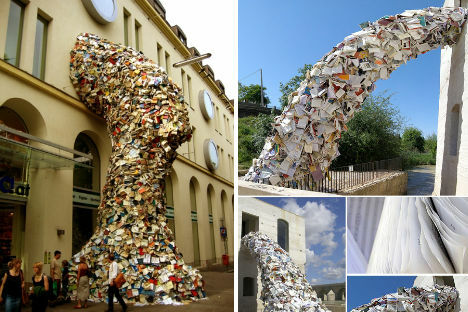 But don't be too quick to criticize this type of book art for destroying perfectly good books, she argues: the books are being given new life. "I am drawn to the aesthetic of a hand-worn book?say the way that a book has been taped lovingly together, or one that speaks of someone having handled it for a very long time as a precious object. I am also attracted to the marginalia in books and how there is this whole other intimacy and world within books that go beyond the story and the work of the original author. And then, you know, you see that these intimate precious objects are then dumped at a used library space and you wonder about the lives of who these people were who had owned the books." Did you know that thousands of books are unsold even when offered for mere pennies or even free? These unwanted books end up in the landfill, because there's currently no infrastructure to recycle the paper, which is low-grade and edged in glue. 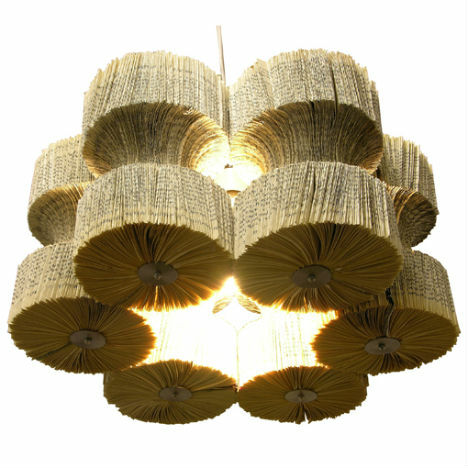 Lucy Norman turns such rejected books into beautiful chandeliers that are equal parts art and décor, making them beautiful to look at even if their words can no longer be read. The stories of five thousand lives are twisted into a whirlwind and thrown out windows in Biografias, an installation in Cordoba, Spain by artist Alicia Martin. It's as if the books have become living entities in themselves, joining together into a monstrous creation that demands notice and attention. "No longer shut away in libraries or reduced to a furnishing accessory, the books/work of this artist turn into a shapeless incumbent concretion that tenaciously clings to the walls of the gallery and seems to elude the laws of gravity," says the curator at Galleria Galica. 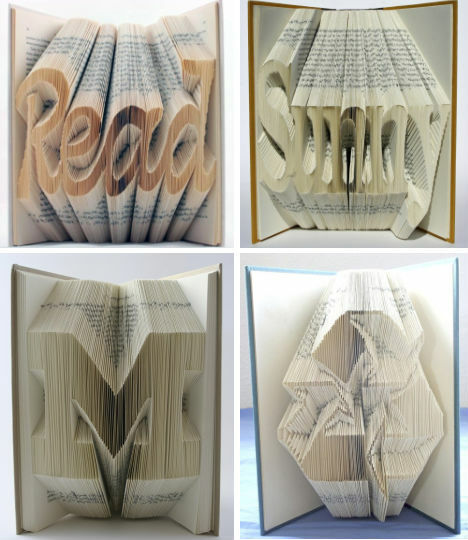 Millions of words contained within the books that form the basis of Veronica Salazar's art are either condensed into a single word or discarded altogether in favor of a new message. The pages are precisely folded to reveal messages that the artist considers inspirational, like 'Read' and 'Dream'. "I see my work as a way to display a meaningful piece of art onto a book that would otherwise sit on a shelf and collect dust; it's also my way of recycling a book that might otherwise end up in a landfill," she says. 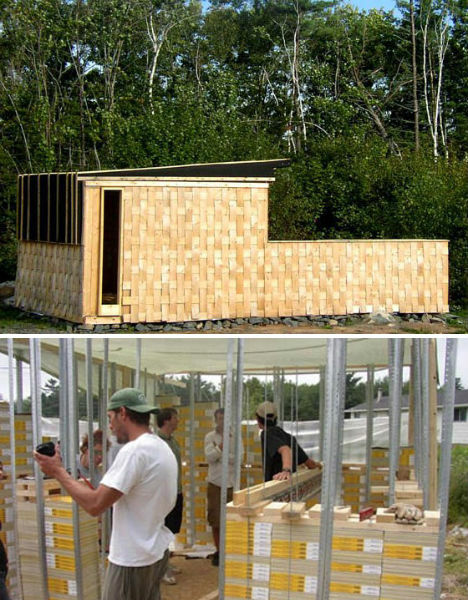 Using books of a different sort – antiquated volumes filled with phone numbers – architect Richard Kroeker and a team of students from the Dalhousie University Department of Architecture in Nova Scotia created a building not for art, but rather as an experiment in adaptability. Even if production stopped today, millions of phone books are still in existence around the world – what are we going to do with them all? In this case, 7,000 books were stacked in columns reinforced with metal and covered in a basket weave facade. The books are so dense that wood can be screwed directly into them.